Professor Roman Voronov’s (PRONOUNCED: VOH-rohn-awf) laboratory at the Otto H. York Department of Chemical, Biological, and Pharmaceutical Engineering, New Jersey Institute of Technology (NJIT) in Newark, NJ! Additionally, our laboratory is heavily involved with Soft Lightography, Hardware Automation, Super-Resolution Microscopy, Computer Vision and Machine Learning. Other projects in the Voronov lab involve understanding the Mechanism of Blood Clot Formation, which is relevant to Thrombo-pathologies such as Strokes, Heart Attacks and Hemophilia. 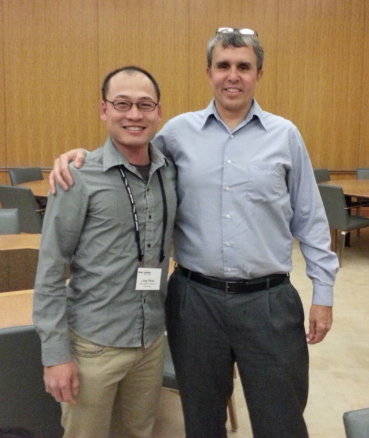 Prof. Voronov’s PhD student Long Pham (graduated in 2018) and 2014 Nobel Prize Laureate in Chemistry (“for the development of super-resolved fluorescence microscopy”) Eric Betzig, at the Lattice Light Sheet Workshop at Janelia Farm Research Campus in Ashburn, VA, February, 2016. Prof. Voronov’s ChemE Car team scores 2nd Place in the AICHE 2019 Regionals Poster Competition! Danh Thanh Nguyen has joined the V-Lab as a PhD student! PhD candidate Femi Kadri has passed his Dissertation Proposal. PhD candidate Long Pham has passed his Dissertation Defense. PhD student Anh Tong has passed her Qualifying Exam. PhD student Anh Tong wins the Spring 2018 NSF I-Corps Site award! December 1, 2017. Prof. Voronov gave an invited Seminar, “Cell-Cell Interactions Affect Fibroblast Directional Decision-Making during Chemotaxis in Tissue-Mimicking Microfluidic Mazes,” at the Center for Engineering in Medicine at the Shriners Hospital (a subsidiary of the Massachusetts General Hospital), Boston, MA. Prof. Voronov wins a one year $35,000 grant from the NJ Health Foundation, titled: “Novel Mechanism of Blood-Clotting Could Revolutionize Stroke and Heart Attack Treatments”. PhD student Long Pham wins the Fall 2015 NSF I-Corps Site award! Prof. Voronov wins the NJIT Faculty Seed Grant, titled: “Collaborative Multidisciplinary Platform for Single Cell Analysis – Microfluidics, Biomedical Imaging, Computation, Drug Delivery & More”. Profs. Basuray and Xu are collaborators on the grant. Dr. Voronov begins as an Assistant Professor at the New Jersey Institute of Technology’s York Otto Department of Chemical, Pharmaceutical and Biological Engineering.